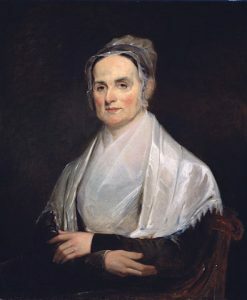 Portrait of Lucretia Mott painted by Joseph Kyle in 1841 courtesy of Smithsonian National Portrait Gallery. One of the suffrage movement’s most dedicated advocates was born on Nantucket Island, Massachusetts, to Quaker parents. Lucretia Coffin’s early years were imbued with a sense of community, industry and a religious commitment to peace and human rights. Her father, Thomas Coffin, was a whale boat captain who often was away from home for extended periods of time. In his absence, her mother, Anna Coffin, operated a dry goods concern from their home to supplement their income. After a three-year absence in South America where his ship was seized and he was unsuccessful in winning it back, Thomas returned home and moved the family to Boston, where he became a merchant. For Lucretia, this fostered another lifelong skill, that of adaptability. Lucretia and her siblings attended school in Boston. According to the custom of the time, girls’ formal education ceased at age 12. Fortunately, both Thomas and Anna Coffin were firm believers in education for all their children. At age 13, the parents sent Lucretia and a younger sister by mail coach to Nine Partners Boarding School in upstate New York, where she met her future husband, James Mott. When she completed her studies, she remained at Nine Partners to teach. By this time, her family had moved from Boston, where the dominant faith practiced was Puritan, to Philadelphia, a more Quaker-friendly state. When she fulfilled her teaching commitment, she moved to Philadelphia to join her family. Mott followed and they eventually wed. Both became active in their Quaker community where her speaking skills and intelligence were recognized and by age 30, Lucretia became a Quaker minister. In 1840, their Quaker community included Lucretia and James in a delegation to the First World Anti-Slavery Meeting in London. The organizers were distressed that women had been sent as delegates and spent the first few days of their meeting discussing whether women could attend. The meeting’s organizers finally decided that women would be allowed in as observers only, not allowed to speak. Here Lucretia met Elizabeth Cady Stanton and they became life-long friends. The treatment they received at the anti-slavery meeting planted the seeds for a women’s rights meeting. Lucretia had read Mary Wollstonecraft’s A Vindication of the Rights of Women (1792), which further enhanced her belief in equal rights for all. 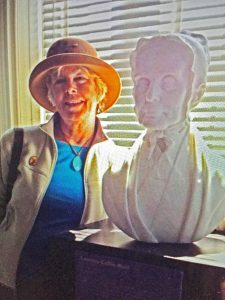 Photo of Patricia A. McCarthy with bust of Lucretia Mott at the Sewall Belmont House by Robbie Morris. Lucretia and James travelled to Virginia in 1842, visiting Harper’s Ferry, Winchester, Fredericksburg and Alexandria, and held 17 meetings in 18 days. She had hoped to address the U.S. Congress, but when that was not possible, she spoke at a nearby Unitarian church. Forty members of Congress, Ralph Waldo Emerson and many others attended. She spoke for two hours addressing the topics of slavery, inequality, religious freedom and the role of women in society. While here, she met with President John Tyler and communicated her agenda of equality. In 1848, she and James visited the Seneca Indian Reservation in upstate New York. They both had been long time supporters of Native American rights. While there, Lucretia met with Elizabeth Cady Stanton, Jane Hunt and Mary Ann McClintock. Their discussion set the foundation for the First Woman’s Rights Convention in Seneca Falls on July 19 and 20 where The Declaration of Sentiments and the Resolutions demanding new rights were formulated and adopted. All the while, Lucretia was tending to the needs of her family. The family’s farm, known as “Roadside” outside of Philadelphia, became a way station on the underground railway and overnight guests like Sojourner Truth often visited. The farm’s location near a Pennsylvania rail station allowed Lucretia to continue her travels to promote her ideals of peace and equality, all against a backdrop of the Civil War. In 1865, the Thirteenth Amendment became part of the U.S. Constitution. The Motts continued their efforts to encourage equals rights in higher education by serving on the board of Swarthmore College, a co-ed college. In January of 1868, her beloved husband of 56 years, James, passed away. This was one of many difficult losses in her life’s journey, for she had lost children, siblings and her adoring mother and father. She continued for 10 years serving on the Board of the Pennsylvania Peace Society until 1880. When she passed away on November 11, 1880, she left a proud legacy of service in the cause of women’s and civil rights. Anna Davis Hallowell, James and Lucretia Mott: Life and Letters (Boston, New York: Houghton, Mifflin and Company, 1884). Jennifer Fisher Bryant, Lucretia Mott: A Guiding Light (Women of Spirit) (Grand Rapids, MI: W. Eerdmans Pub., 1995).